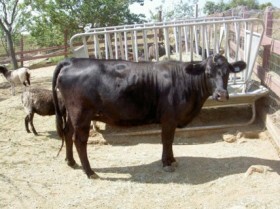 Cattle that are eating hay or grain must be fed in feeders. Cows that eat off the ground are more likely to have worms, malnutrition, and copper deficiency, among other things. Cows that eat hay on the ground waste a considerable amount of hay because they urinate on the hay. The care-taker commonly feeds the fresh hay on top of the urine soaked hay, which contaminates the hay even further. We estimate that you spend twice as much money on hay when your animals are fed on the ground, meaning that feeders pay for themselves quickly. What typically occurs is the bossiest cows will eat the clean hay, and leave the more timid animals the dirty hay, making a sharp distinction in weight and coat condition between members of the herd. Cows fed grain on the dirt may eat equal amounts of dirt to grain, depending what kind of soil you have. Dirt ingestion is very hard on their rumens, and also clogs up their rumen magnets with iron from the soil. In copper deficient areas, cows that eat off the ground will invariably have white hairs around their eyes because molybdenum and sulfates in the soil interfere with copper absorption. Although tubs are okay for hay feeders, they are only adequate if they are dumped out frequently, as they get humid and hay starts to rot in the bottom. Even with holes drilled in the bottom of the tubs, wet hay will clog the holes. People start piling new hay on top of the old hay in the tub, which creates waste as the new hay contacts the old hay. Eventually there is a hot, smelly, moldy, slime of rotten hay filling the tub. The people don’t notice, but the animals have to eat with their face in that smell everyday, and keep wasting hay as they skim only the freshest, cleanest layer off the top. It is much better to have some sort of rack-feeder for hay, so the hay stays clean and dry. The rack should have some sort of catch-tray so that hay that falls out of the rack is not trampled on the ground and wasted. Grain can be fed from tubs, or fed from the catch-tray of a hay feeder. The most readily available feeders in our area are made of pipe similar to pipe corrals. They are made for horses, but we order them with shortened legs so the cows can reach them. These feeders are a little pricey, but again, they pay for themselves quickly. The feeders have a catch-tray for hay that falls out of the rack, and the tray also works nicely for grain. The trays have small holes drilled into them to drain away moisture, but the holes are not big enough for the grain to fall though. We usually tie the feeders to a post so they are not tipped over on some unsuspecting calf. We used to make our own feeders out of 4 X 4 posts, but even with the proper brackets, have found that they fall apart in 5 years or so, requiring maintenance, and a need to constantly check for loose screws or nails from the brackets. Another added benefit of the metal pipe feeders is that our animals no longer pull out their ear tags on the feeders. There is simply nothing square or jagged for the tags to catch on. Thank-you for all these articles. As a cattle newbie, this has been great reading! Would you be able to tell me where it is you get your hay feeders from? I was hoping to look more closely at the product and see a price. Our round bale feeders are available at Tractor Supply and Southern States. The rack-type feeders were custom made but I think Priefert has several comparable models.